I just wanted to post my first experience with my new Gen 3 Filmless WP NV monocular. I also invite some of the other members who just received their's to jump in and report also. It operated flawlessly. I had as much fun terrestrially as I did astronomically! I watched bats skimming across the surface of the lake, geese paddling across the lake almost like it was day time. I watched deer across the field eating at the edges. There is one street lamp about 150 yards to my north and one about 120 yards to my south. They are the only two street lamps on my little dead end street. Normally they are enough light to slightly illuminate the street in front of my house but with THIS?? It was like high noon on a cloudless day!! Astronomically, my house is less than desirable. I had to give up my observatory when we moved here and this new house is not conducive to observing. I have a couple of spots where I can see some of the sky unobstructed but to do REAL observing I have to go to a couple different sites. So, last night was a little cloudy, just patchy and I only got to see some area's at different times which means I would have to walk to the front of the house for a while and then walk to the back and then over to the side. I also don't have everything hooked up together so all I could use was the monocular by itself and with the 3x image magnifier. From what I could see it is different that looking with the naked eye in very nuanced ways.... ways that are hard to put into words just now but...in short, I think it is magnificent. The stars are brilliant and separate. You can tell that each star, obviously, is brightened electronically but not in a distracting or off putting way... just like looking at a monitor view of a live camera. You know you're not looking AT the real star, just an electronic facsimile but it's still gorgeous, captivating and riveting. Clusters are dazzling and the milky way is nothing short of huge, stunning and awe inspiring when viewed through an image intensifier. The ability to look at 1x and see the shear amount of stars that you're able to see is nothing short of breath taking. Yes, I could have spent this money... plus some extra.... for a set of quality glass but all that would have given me is some minor, subtle variances on what my current scopes give me. This thing gives me a whole new experience!!! 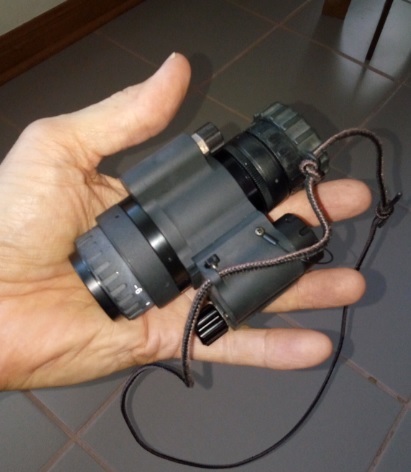 Plus, I get to use this by itself, with telescopes, with smaller magnifying devices like SLR lenses (sp) or other image magnifiers made for the NV device. I have no doubt that members with more experience could add to that list a bit. The versatility of this device is fantastic and the portability is wonderful; in context of astronomical viewing. I'm quit happy with my choice... I could have gone with a high dollar APO but in the end I'm glad that I went this direction. Edited by Dark Night, 28 August 2016 - 12:28 AM. My Mod 3 with the Gen 3 Filmless WP NV monocularw arrived yesterday. Since it was daylight, I put the battery in and just wandered around the house, peeking into dark closets & rooms. I was surprised how much you can see through just the pinhole in the lens cap. It was like it was daylight in all the dark areas I looked. pass over, and one of them flared! And it wasn't an Iridium Flare. This device is so impressive. I just took my wife out walking down the street to the end of the road and out on the **** to look at the stars. It's still partly clear/partly cloudy but clear enough to be usable. My wife has been with me looking through my 10" dob in high magnification and looking through my WO 66 under very low magnification. There has been three times that I KNEW it made an impact. 2) the first time she saw Saturn, it was a very clear night on vacation in Nevada, it was high magnification and that time she exclaimed " Oh Honey"... made me really smile. 3) tonight standing on the dam and she looked up using my Mod 3 WP monocular... this time she said "oooohhhhhh wwwoooowwww... I've never seen sooooo many stars!!! They look like little points of diamonds!!!" When she said that, I KNEW I had made a good decision purchasing this little gem. I can't wait to get it setup with filters so she can REALLY see what a Nebula looks like, instead of it being a small smudge or a vague wisp. I'm REALLY looking forward to seeing the Orion Nebula with this thing!!! Only by then, hopefully it will be THESE things! This is just one, very cool, versatile, FUN device!!! You don't need to wait for Orion! With a narrowband H-a, the Lagoon practically glows in the filmless tube. This was an unexpected and significant difference between the L3 filmless and the PVS-7. Glad you are enjoying the device. :-) Your wife's reaction is basically the same as every person I've ever shown the NV to. This is why I believe that NV is a fundamental game changer for astronomy outreach. Looking for some advice now that my AB Mod 3 monocular has arrived. As others have said, it shows an amazing number of stars. What else should I plan on doing to fully utilize this tool? - Get a narrowband H-a filter? What filter fits into the (30.5"? 37mm?) opening of the objective lens? Does this work suitably at 1x or do I need magnification? What step-up adapter allows me to attach a 1.25" or 2" filter (I already have the latter) to this device? The step up rings I've seen are for 49mm or 52mm, not 50.8mm. Am I missing something here? What exactly are the thread specs for the female threads at the front of the objective lens? - Get a c-mount to Nikon adapter (on the way) so I can use my Nikon telephoto/zoom lenses? I'm thinking of a f/2.8 80-200 zoom. Edited by MJB87, 28 August 2016 - 07:33 AM. Yes, you need an H-a. 12nm or narrower. If you are under very bright skies, narrower is going to be better but under deep suburb or dark skies, a 12nm might be OK. There are a lot of things that are so big that the best way to see them is at 1x, Under moderately dark skies, you can see the entire "C" of Barnard's loop. RAFCamera is also close to production on a long connector that replaces the rear connector on the 3x (which just unscrews). This allows you to mount the filter on to the ENVIS, then you can slip the connector over the filter and lock it down to the ENVIS with a thumb screw. Zooms tend to not produce stars as sharp as fixed lenses and an Apo lens or ED lens is going to be sharper than a standard lens, and these big, fast zooms are really heavy, so I would not recommend them. I would instead recommend something like a 180mm or 200 mm fixed ED lens. As many have commented, with NV, filters are crucial to the experience. If you've only looked at the unfiltered view, you're just at the beginning of the adventure! Thanks to all for the great advice. I've ordered the adapter from RAF camera. As for lenses, I've got a lot of money sunk into high quality Nikon ED zoom lenses and while a telephoto would be better than a zoom I've got what I've got (including a 200-400 F/4 ED zoom with VR) and I'm not inclined to buy any more. In any case, I'll be using these on a tripod so stability isn't my primary concern. I have a question about the Ha filters. Are multiple sensitivities required? advised? Or is the sensitivity based on your light pollution? If the latter how do you judge what you need to buy? I'd hate to spend $400/$500 dollars on an Astrodon 3nm filter when all I need is the Astronomik H-Alpha 12nm CCD Filter that I currently have. Any input oh experienced ones? The 12nm will indeed work quite well even in a white zone, but the 5-7nm range seems to be giving a better result for teasing out the faintest extensions. I am still using the 12nm and am pretty happy with it for now, but I do intend to pick up a 7nm soon. I have no trouble though seeing the Horse's Head with the 12nm using the 12" dob, so while the narrower bands may bring out a little more, there is still a lot you can do with the 12nm, so I would keep it. I have an Orion 7nm which I'm very happy with. It already seems like it's cutting down on a lot off light. What I mean by that is that with the manual gain on the mod3, I can get a good sense of the contrast/scintillation trade off curve, and there's not a lot more photons it can provide me without greatly increasing the amount of distracting scintillation. Now, maybe I'm thinking about this wrong, but it seems like a 3nm would just make this problem a little worse, even if it highlights more detail in certain areas. good input... I'll work on getting the Astronomik 12nm filter in play and just keep my eye open for an Ha with greater sensitivity on the used market. 3nm, 7nm get used the most. The 3nm is particularly effective in moonlight. With each narrower filter, the contrast increases. The noise increase from 7nm to 3nm is only slightly more and to me is negligible. With the pvs-4's and gain control, it still produces a very clean image with gain down a hair. - Something magical about turning Night into Day as I swept around the yard and tree line. - Although the tube is white phosphorus it has a distinct blue cast to my eye. - I was under the impression that it would not be useful under light pollution without filters. Not so. The sky view is improved somewhat. However, I would only operate in this mode if I had forgotten or lost my filter(s). - The view is *greatly* improved with a long-pass filter. Bortle 5 skies look better than Bortle 2 with naked eye. I would have to do a controlled count (perhaps the bowl of the Little Dipper) but my initial guesstimation is that I am pulling at least 2 magnitudes fainter than naked eye. There were stars everywhere - even off Milky Way! - The Ha 12nm view was even better! It does however increase scintillation. - One forgets about scintillation very quickly. - The North American Nebula, Pelican, and complex south of there easily seen with direct vision and detailed at 3x. It really does look like a Pelican, no averted imagination required. - M31 was easy to see. Bright in fact. And I'm not just talking about the core. Easy to see the 4 degree extent of the arms at 1x. Interestingly, I failed to pick up M33. I'll try again tonight. - While the unit weighs about the same as a medium powered eyepiece and is easy to hand-hold, I suspect the experience would be much nicer with a hands-free helmet mount - provided one gets a comfortable helmet. - The gain control is great! I am still experimenting, but I don't appear to lose the faint stars by increasing the gain. Indeed, by turning down the gain I can start dropping stars out to the point where it simulates a conventional eyepiece view. - I have used many "wide field" or "richest field" instruments. Among others 7x50 binos, 25x100 binocular telescopes, IS binoculars, an Edmund Astroscan, and a Jaegers 6" f/5 refractor. I now realize that the term "richest field" is absolutely wasted on these instruments. - There was possibly one small glitch - I may have dust somewhere inside of my tube that is causing a subtle "texture" effect. I tried to duplicate this looking at a white wall in an interior closest this morning with a towel stuffed under the door. Couldn't do it. I'll try again tonight and consult with Rich at Ultimate Night Vision tomorrow. Aside from that - an amazing device! Edited by Jeff Morgan, 28 August 2016 - 12:15 PM. Yes, blueish tone on terrestrial and on brighter stars but with the gain turned down, stars look more whiteish than bluish. And as you have found for your self, one of the oft mentioned negatives by people that have never used this gear, scintillation, gets looked past mighty easily because you can see so much more that you don't even notice it! Same with the 40 degree apparent field. It is so full of stuff, that your eye seems quite satisfied with the view without it having to be any wider, and I think if it were wider, it might actually be to distracting! There is just so much to see. I mean comon! You can fit the entire Barnard's Loop, Flame, HH, Orion and Rosette in the same 40 degree apparent field of view!!!! I see so much stuff that the scintillation and apparent field are so much out of my mind that they might as well not exist. I recommend a reclining lawn chair as an observing chair. One of the old yard sale aluminum ones works great! Hopefully nothing serious with the tube, but I am pretty confident that Richard will work with you to sort it out. While the NV market may be small, I know that Richard and Tyler both want to be seen as the go-to provider for this community. I have talked to both of them and explained at length that the audience here is finicky and that things a hog hunter won't notice are things we might, so I believe they understand our expectations are going to be more demanding. And yes, this is the richest field viewing I have ever know. Entire constellations become giant open clusters adorned in nebula and tiny clusters of stars. Auriga is a great example (and you will see soon enough). The Constellation itself is glorious at 1x and even at 1x, you can see the tiny little knots of stars formed by M36 and M37, but even at 1x, the "Starfish" shape of M38 can be resolved. With H-a, you see the Flaming Star Nebula IC 405 which by itself is a very interesting object, but when surrounded by the giant cluster we call Auriga and studded with the little gemlike clusters, it is a pretty beautiful sight. I have come to call 1x, and 3x oberving "Big Field" observing. "Wide Field" does not really capture it because a lot of people think 5 to 6 degrees is a "Wide" field and as compared to NV fields, these are like looking at the sky through a soda straw. NV fields are truly BIG! And this is good because as it turns out, the sky is full of BIG stuff. Can't wait for you to see the California Nebula or Rosette nebula. Because most people can't see them, they don't realize how big they really are! Night vision will re-set your scale of the universe. I saw a UFO last night. The best way to describe it is, it looked like a string moving across the sky. I thought maybe it was a flock of birds, but it was waving too much to be that, like it was being pushed by the wind. Except there was no wind. It wasn't an aircraft. I couldn't really judge how big it was, since I didn't know its distance to me. It apparently moving under its own power or was being pushed by high altitude winds. It was visible for about 30 seconds. Edited by Rocket Ron, 28 August 2016 - 05:18 PM. I think the "texture" is due to the fibre plate, if you move the scope about your brain will reduce its effect, it does interfere with seeing milky way structure a bit. I have a pair of zero gravity recliners that are just perfect. There was an old post from the Binocular forum that just came to mind that suggests another mounting solution - the Manfrotto Magic Arm. Just attach it to the recliner. The observing goal will be primarily telescopic tonight. Cloud cover and transparency is improving but still questionable, so I will set up the 4.7" f/8.5 apo. Easier than the Dob. There was an article back in the mid 80's in Sky & Telescope concerning what is "richest field". IIRC, basically it was not a telescope, focal ratio, or AFOV thing - the limiting factor was the density of stars and opacity of the Milky Way. His solution was you needed only to reach down to 11th magnitude and his preferred instrument was pretty modest - a 5" Jaegers refractor. I'll have to look that article up and review his logic as it applies to NV. Yes, basically I have read that any combination that gives a 7mm exit pupil is the richest field scope, but also I know the article you mention and the thinking behind that. Still, I have used telescopes from 50mm to 356mm and I have never in my life seen anything close to the number os stars in the field of a NV device. Last spring, I was out under pitch black skies in New Mexico, and viewing towards the south of the winder Milky Way, I saw so many stars in a single field of view that they looked like sand on a beach. The entire view was filled with the granularity of what seemed like 10,000 stars. It was epic. I don't really know how many stars I could see, but it had to be many thousands. I have a few questions on lanyard cords, since dummy me had already misplaced the lens cap (but found it, whew!). On the Mod 3, there is only a single attachment point on the housing, and one on the lens cap. Which lanyard cord would you recommend? I don't want to attach the lens cap to the housing, so where would be good spot to attach the lens cap to? I had the Vixen 2.1 x 42's. It was somewhat easier to recognize constellations in the Vixens because the NV reveals so many stars the familiar pattern is harder to pick out. But I like my NV tube better - killer on emission nebula! There are many ways to do it but the simplest way is to tie a simple knot about 6" from one end and thread on the lens cap with the objective side facing the know. Now, thread the long side opposite the knot though the housing and bring it to the other end, then tie a square knot. The 6" knot will just keep the device from slipping to the end cap (which could be tied with its own simple knot for positive spacing if you like. Lots of ways to do it, but for Monocular, it will be some kind of loop.